2 Beds 2 Baths 1,756 Sq. ft. 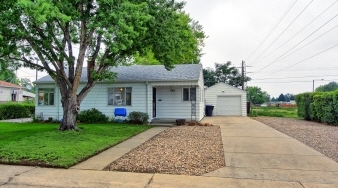 Very well maintained ranch home on beautiful lot. Same owner for the last 60 years has taken great care of this home. Newer furnace, water heater, electrical panel. Updated Kitchen with oversized raised panel Oak cabinets; beautiful wood floors under carpet. Oversized 1 car garage and tons of off-street parking for your boats/RV. Needs a few updates but is in move-in condition. Check comps, this is priced well for square footage. Steps from Athmar Park. Come quick before it goes away.